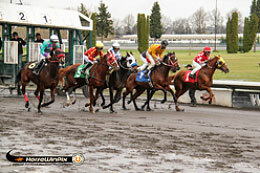 Portland Meadows will host the Portland Meadows Fall Derby on Monday, November 20. PORTLAND, OR�NOVEMBER 6, 2017�CM Partners In Crime turned in the best time for the Portland Meadows Fall Derby trials on Monday at Portland Meadows. Cm Partners In Crime completed the 400 yards by dashing home in a time of 20:61 under jockey David Martin. Jockey Luis Gonzalez was originally named to ride the three year old daughter ofIVORY JAMES but was replaced after he fell from his mount Awesome Corona in day�s first race. CM Partners In Crime is Trained by Nick Lowe for owner/breeder Randy Dickerson. It was the fourth win in 16 starts for the Oregon-bred filly from the Strawfly Special mare Im Special Star. CLICK HERE for the complete field to the Portland Meadows Fall Derby including times, sires, dams, owners, breeders, trainers and jockeys. The $10,000-added Portland Meadows Fall Derby will be run on Monday, November 20th.